They really are basically the same recipe except the savory ones had a bit of heat (which I left out) and a bit less sugar (which I ramped up). Nutmeg sounds just delicious in a corn muffin…I have never tried that…thanks for the idea! Yours look lovely. YUM! Nutmeg in a corn muffin?! I must try these! Yours look SO good!!! Hold your head up, these look like great corn muffins!! How funny! They look delicious and I can’t wait to try them. When I bake these, I intend to copy you exactly – leaving corn out cornbread is always my first thought (although I chopped it for my muffins) and the nutmeg sounds fab. Doh! You know I don’t mind, my baby! These look delish. Great muffins, despite the brain fart. I was tempted to make both for comparison’s sake. I keep wanting to make these, so I’m jealous of your mistake 🙂 Good to know about the nutmeg. Mmm…nutmeg. I’m glad you enjoyed the (wrong) muffins! I made the playing around version, which does have the extra sugar. I like them sweet too. I have heard many raves about the corniest corn muffins! Heck, if you do enough of “playing around” with the savory corn & pepper muffins, you wind up with the corniest corn anyway — so I think you just took the playing around to the outer limits! 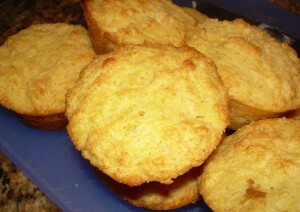 They look great; I love a sweet corn muffin! How funny… I don’t think you’re the only one that mixed up the recipes, though. I can’t wait to try this version out (to see if I like it better). There is no need to hang your head in shame, these turned out lovely. You are just ahead of us and made a future recipe! 🙂 These look great. You did a beautiful job! No need to hang your head! Great job on the muffins! I’ve made both recipes, and this recipe that you made is my personal favorite of the two.